What more could “Mom” ask for? Jackson Reece Herbal Baby Wipes are biodegradable, non-toxic, paraben-free, alcohol-free, chlorine-free and hypoallergenic, for starters! Brand new to the market, these oh-so-gentle baby wipes were designed for the most delicate of skin, created with ingredients that have been derived from renewable natural plant resources. The wipes are thick and absorbent, and clean baby’s sensitive areas as well as face and hands beautifully! 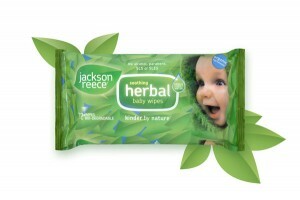 Not just for babies, Jackson Reece Herbal Baby Wipes can be used by anyone – those with allergies, eczema, and other sensitivities. The biodegradeable wipes arrive in a package of 72 wipes, and can be packed into a diaper bag, purse, or backpack for on-the-go! For more information or to order, visit their website. Transition from Play to Work: 3 Tips to Keep Your Kids Active Recipe of the Day!